I’m going to be trading one of my bird for a Pineapple Conure. The person said the bird is a male and is 3 months old. I was just wanting to get some opinions before I trade. Is it fairly easy to tame and train a 3 month old male pineapple conure. He said the bird was never handles by people yet. I asked if the bird was hand fed but he didn’t answer yet. He did say he bred the parents himself so I’d assume he handfed the bird. Please help! Types of Birds Owned: Indian ringneck, conure, raven, crow, hawk, parakeets, cockatoo, lorie. First of all, there is no such thing as a 'pineapple conure' - 'pineapple' is just a GCC mutation so what you would get is a pineapple GCC, and anything that applies to a GCC applies to them. Secondly, unless the bird was DNA'd, you really do not know if you have a male or a female because, as far as I know, all the genetic charts indicate that all combinations that produce cinnamon males also produce cinnamon females. If the breeder says that the bird was never handled by people, it means that the bird was not handfed and, therefore, you'll need to tame before you can bond and only after this you can start training -which is fine because you should not train a baby or a juvenile. As to how easy it is to train GCCs... well, they do bond very deeply when they are handfed so training is not hard at all BUT the only thing that GCCs want to do is perch on your shoulder and cuddle against your neck or burrow inside your shirt so, although the deep bond does help a lot, their natural proclivity for nothing but cuddles doesn't help. I also have to mention that trading a bird for another is something that a collector would do, not a bird lover. If you're trading one of your birds to a breeder, make sure you have visited his actual breeding facility. The one I saw was pretty horrific. Pajarita wrote: First of all, there is no such thing as a 'pineapple conure' - 'pineapple' is just a GCC mutation so what you would get is a pineapple GCC, and anything that applies to a GCC applies to them. Secondly, unless the bird was DNA'd, you really do not know if you have a male or a female because, as far as I know, all the genetic charts indicate that all combinations that produce cinnamon males also produce cinnamon females. If the breeder says that the bird was never handled by people, it means that the bird was not handfed and, therefore, you'll need to tame before you can bond and only after this you can start training -which is fine because you should not train a baby or a juvenile. As to how easy it is to train GCCs... well, they do bond very deeply when they are handfed so training is not hard at all BUT the only thing that GCCs want to do is perch on your shoulder and cuddle against your neck or burrow inside your shirt so, although the deep bond does help a lot, their natural proclivity for nothing but cuddles doesn't help. Hm, sorry but this post seemed a bit rude. I know that ‘pineapple’ green cheek is just a color mutation. I didn’t say it wasn’t. I’ve known the man I’m trading with for almost 15 years so I know how he treats his birds and I’ve traded with him many times before. I AM a bird lover and it’s very stupid of you to even say that. I love the bird I’m trading so much I’m sending him somewhere he will be more fit and happier to go. Next time when someone asks for help don’t be all snappy and rude about your answer. I didn’t specifically ask for an ignorant answer okay? But thanks anyway. 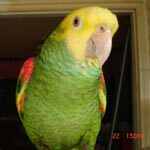 Navre wrote: If you're trading one of your birds to a breeder, make sure you have visited his actual breeding facility. The one I saw was pretty horrific. As to rehoming a bird to a breeder and this breeder giving birds a good home... well, we will have to agree to disagree about that. Petall, your have logged in to not just a web sight but a world wide neighborhood. It has been running for many years and we know each other and our birdy babies. I saved Myrtle from a breeder and have adopted a few times from breeders. Maggie was a breeder bird who's mate died and she would not take another mate. My son paid $10 to get her and give her to me. I think I have had her since 2012 and just last year she accepted Andy to sit by her on a perch. I got Shadow and Lemone' from an over stalked breeder for $10 each. The perches were full and they had become accustom to hanging on the cage to sleep. It was at least a month before they decided that they had enough room to perch. I don't understand how you can give a birdy baby to a breeder.